ASA Combo Packages: A Premium Education at a Discount! We love what we do, and there’s nothing more rewarding than taking someone from their first time on the water and helping them develop into an experienced and confident sailor. Experienced is the key word here. That’s what sets Narragansett Sailing apart from other sailing schools. Our courses give you the opportunity to learn in an up close and personal environment with more time on the water and less time focused on theory. It’s because of our love of sailing that we’ve decided to combine some of our basic courses into one valuable combo package. This package deal takes you from an introductory course to a point where you become a little more confident and knowledgeable. Each course works well with the other one to build on the lessons you’ve already learned, and to give you a solid foundation for more advanced sailing techniques. The first three courses are usually offered at a little over $1000 apiece. This combo package provides the courses at an even $1000, allowing for a 15% discount off of the overall price. This discount gets even better when you choose to participate in couple’s courses. This allows you to get a quality education complete with time on the water for only $3000 per individual and $5000 per couple. Let’s face it, when it comes to sailing the more the merrier! The three courses offered take you from your status as a beginner to someone who can confidently navigate the world of sailing. Taking all three of these allows you to keep the information fresh in your mind as you move from one course to another. This is the best way to pick up on the lessons, and to build on your experience. We pride ourselves in the ability to integrate theory with a hands-on approach. This is what gives us an edge when it comes to teaching, and this is magnified when you commit to our first three courses that are designed to complement one another. ASA 101 Basic Sailing – This course is taught by an ASA certified instructor who focuses on teaching you the basics. You’ll have the opportunity to work on a 20’ Bristol with a tiller and an outboard engine, or a 30’ Pearson with the steering wheel and an inboard engine. Classes will take place over three days, allowing for 8-hours of instruction each day. The goal is to give you a strong platform from which to learn more advanced techniques. 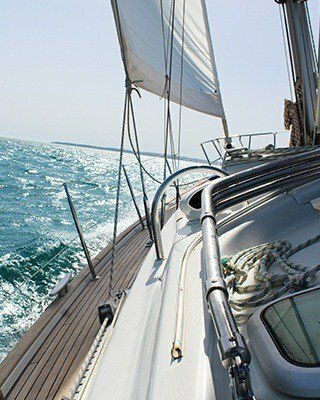 ASA 103 Basic Cruising – This ASA certified course focuses on docking skills, anchoring, reefing, grounding, and dead reckoning navigation. In other words, it takes everything you learned in ASA 101 to the next level of sailing. Taking these courses concurrent with one another eliminates the need to take time to refresh your knowledge of previous materials. This course is taught on a 30’ boat with wheel steering and inboard diesel. Again, it takes place over three 8-hour days, allowing for 24-hours of instruction time. ASA 104 Intermediate Cruising – The focus of this course is to help you comfortably manage the boat over a three-day period. We take you on a liveaboard journey circumnavigating Narragansett Bay that allows you to experience multiple harbors, lots of anchoring, and close quarter maneuvering under power. This helps you to develop a confidence in your sailing abilities that you just can’t get from a textbook or a single course. This package deal is good for a year, take the classes at separate times or within a 9 day time period. We offer the nine day package with a live-aboard option on June 21 – 29th or on September 16 – 24th. Why Take All Three Courses? As we’ve mentioned, sailing is our obsession and teaching it is something that we’re extremely passionate about. We want you to get the most value for your money, while providing you with a comprehensive curriculum that gives you the strongest possible foundation for a future spent on the water. We take pride in your ability to walk away from these courses with the confidence that only comes from experience. Taking all three of these courses concurrently allows you to flow from one to the other without losing any information in the interim. You’re more likely to expound upon your knowledge of sailing if you purchase all three courses together. It’s also a great way to save money. Even if you can’t get to the courses one right after the other, it still keeps you motivated to learn more and to take your love of sailing to the next level.